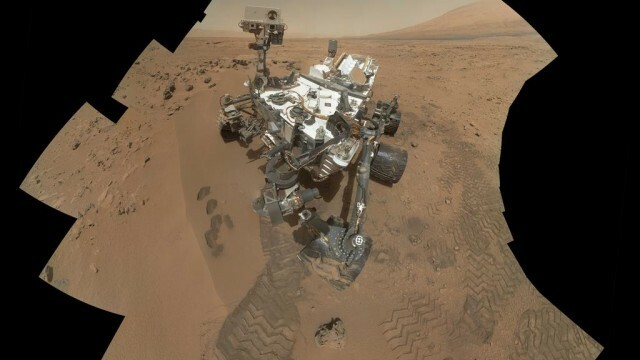 NASA's Curiosity rover is still chugging along on the surface of Mars (contrary to early reports, it is still in operation despite the government shutdown). In the 14 months since it landed, the nuclear-powered robot has documented an ancient stream bed, found some of the chemicals necessary for supporting life and shot lasers at hapless rocks with Twitter accounts. Now it's on a six-month trek to Mount Sharp, where it will examine ancient Martian geology. "The foothills, that's the place we really want to go to," NASA systems engineer Bobak Ferdowsi explained to me. Ferdowsi, also known as "The Mohawk Guy," dropped by KQED for a visit (he grew up watching KQED), so we swapped a tour for an interview. He said he's excited about what the rover might find at Mt. Sharp. "Even from this distance, with our cameras, we can see layering in the rock, kind of like Grand Canyon-sort of sediments," he marveled. "And that's amazing. You can imagine just kind of working your way up that layering and getting an entire history of Mars in that area." Ferdowsi was a science fiction fan as a kid (surprise), especially of Star Trek and Arthur C. Clarke, which helped jump-start the work he does now. "(Clarke) had a real depth of understanding of the science of it all," Ferdowsi told me, noting a special fondness for science fiction rooted in real science. "Even though it's fantastic in some ways, he always has a basis in, 'How would that spaceship really work, and how would they actually have done this?' And I think that's the kind of stuff that I love the most." And would he like to join the rover on Mars? "If it wasn't a one-way trip, I think I would consider going to Mars. I think it's such an interesting time for us. I hope we get to send people there. As much as I love working with robots, I think there's something special about seeing humans get to these other places."